King Gizzard and the Lizard Wizard were one of the breakthrough acts at this year’s Glastonbury Festival as they brought their brand of psychedelic rock to the Park and William’s Green stages. 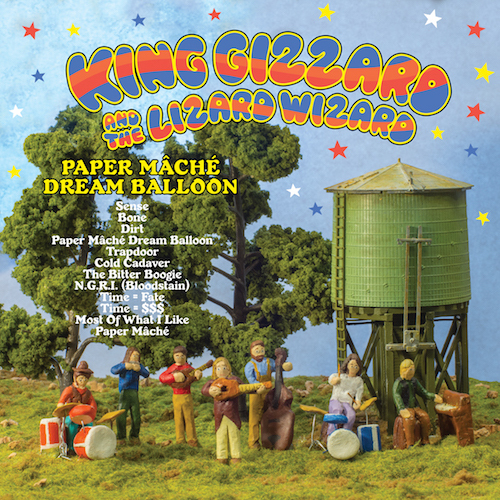 However, these are no new artists, since forming in Australia in 2010 King Gizzard and the Lizard Wizard have churned out seven fun packed albums ranging from heavy rock to this piece of perfect pop psychedelia. For Paper Mache Dream Balloon out go the distorted guitars and lengthy conceptual moments and in comes purely acoustic instruments, allowing front man Stu Mackenzie’s excellent flute playing to shine amid the double basses, harmonicas, violins, acoustic guitars and clarinet. The result is a whimsical album, like the soundtrack to a lost Australian kids pop show from 1969. Fans of more latter day psychedelic exponents such as Dukes of Stratosphear and more recently Papernut Cambridge will love this especially as it harks back so vividly to those innocent days of lava lamp pop. At times it is bizarre, like the frenetic Trapdoor and Bitter Boogie that sounds like a warped version of Norman Greenbaum’s 1969 classic Spirit in the Sky. Mostly though its just great pop with Bone, the title track, Dirt and NGRI (Bloodstain) among many, many highlights. After seeing them live I realized how fun this band is. Here they take the fun to a new level and produce one of our favourite albums of the year.